Very good numbers of monarchs are being seen today along the dunes in Cape May Point, most often seen feeding on the flowers of seaside goldenrod. It's a beautiful day with lots of migrating birds to enjoy, too. 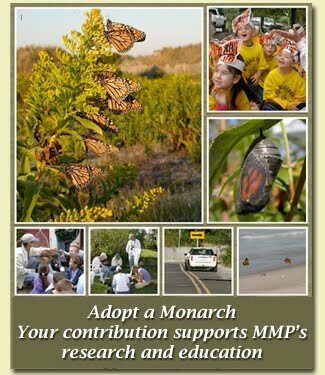 We hear reports of very good monarch numbers at other areas along the Atlantic coast here in Cape May County, including Stone Harbor Point. The weather forecast suggests that monarch numbers will continue to be good for the next few days, perhaps even building up beyond the current numbers.